This weekend we hosted our friends Such Sweet Tierney for a special pop-up shop event! We loved seeing all the beautiful art, home goods and accessories in our shop. It's so fun to get fresh new products through our doors! Such Sweet Tierney creates hand printed textiles and paper goods for everyday living. All designs are first rendered onto paper with pens and paint, and manually screen-printed using eco-friendly water based inks in hand mixed colors. Everything is printed, assembled and sewn in their studio, located in the historic Pioneer Square neighborhood of Seattle. Such Sweet Tierney is comprised of husband and wife team London Tierney and Christian Perry. We've always loved supporting other local artists and designers, and having the shop has been an extra great way to do that. Talking shop with London and watching our customers connect with her work made it a really great day. If you missed the event, don't worry. We're now carrying a selection of Such Sweet Tierney's products in shop year round! Today is the first day of the National Stationery Show! We're in New York meeting amazing people and talking about paper all day long. Sounds great, huh? To celebrate, here are photos of the long awaited C&Co. Lookbook! It's been such a long process from concept to photo shoots, edits, and finally having the printed piece in hand. I can't explain how happy it makes me to share this slice of life in Seattle with the people we're meeting in NYC. Once we get home, i'll write and share about the show - stay tuned! This post is part of an on-going series of features from our C&Co. lookbook. To view the lookbook in its printed form, you can order your own copy on Blurb or view the full digital version on Issuu. Linoleum isn't just for floors. Recently my "picker" parents and lil' sis found these vintage Speedball linoleum tools at an estate sale. There's nothing better than antiques that are unused and still 100% useful! I chose linoleum cut as the production method for my Cosmic Sans piece. The letterpress printer side of me was excited to use a handmade method for the entirety of my piece. I sketched it out on paper, then onto the linoleum block, and got to carving! My letter is M for McNally and also Meteor! I was inspired by traditional engravings of meteor showers like this one. Growing up, I remember many nights laying on a lawn chair in the front yard with my parents, watching the shooting stars. They were such mysterious nights - being little and outside during hours I'd never seen before. I was always half excited and half terrified. Nighttime was magical when I was a child. I think that's why I still love space - it's mysterious and exciting and scary. It's something we can't know completely. I love that. Want to see the finished piece? Come to our Cosmic Sans opening! This will be one of 26 never-before-seen space & sci-fi inspired art prints. Each will be sold via silent auction to benefit 826 Seattle, inspiring kids to learn and write. 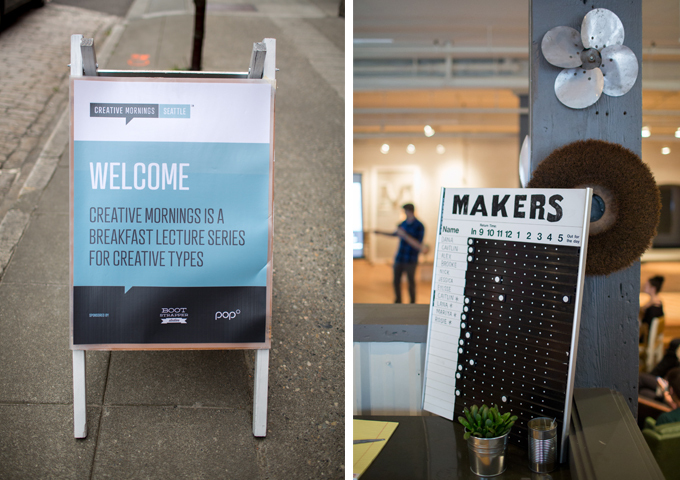 CreativeMornings is a monthly breakfast lecture series for "creative types." Each event is free, includes a 20 minute talk & 20 minutes of Q&A, and brings together creative folks to share their work and experiences. CreativeMornings was started in New York City in 2009 by Tina Roth Eisenberg (SwissMiss), to create an "accessible, inspiring morning event for people to meet." We're big fans of CreativeMornings - we love attending the Seattle events, and enjoy impromptu CreativeMornings in the office, listening to the wealth of content available from all over the world! These photos of the event are by the lovely and talented Jenny Linquist. It was a huge honor to be asked to speak. We have by no means "arrived," and are learning more and more every day. Writing this talk was an awesome opportunity for the two of us to think and talk through our story and our experiences. We have a tendency in our busy life to get bogged down in minutia and forget to step back and look at where we've been. It was incredibly refreshing to get to share about what we love to do and what we've learned along the way. We have a heart for the creative folks in Seattle. We want to be honest about our journey and the reality of owning a business in order to support, inspire, and be in community with more and more creative small businesses in our city. Here's the text of the talk - for those of you who prefer reading to listening or watching my quirky self. I'm Sara McNally. My husband Brad and I are the founders of Constellation & Co., a small studio in Pioneer Square. We offer full service graphic design and letterpress printing for a variety of client projects, including: wedding invitations, branding and print collateral for small businesses, and a line of letterpress greeting cards and paper gifts that is available in stores in Seattle and nationwide. We use a mixture of modern and historical technologies to produce work that is sometimes sweet, sometimes sarcastic, but always inspired by handmade processes, vintage ephemera, and collaboration. While in design school, I got to the section of Megg's History of Graphic Design about printing in the industrial revolution and found my calling. In my mind, they'd reached the pinnacle of craft, and I wasn't interested in moving forward. That dream of the 1890's thing totally hits home for me. Since then, I've become passionate about collecting, restoring, and preserving artifacts from the history of design and printing, and putting them back into use. I love that our cast iron printing presses have lasted for over one hundred years in a world that is constantly changing and reinventing itself. There is something so satisfying about this tangible method of printing and design - it's something we desire more and more in our digital world. I'm honored to be preserving and continuing a historic craft, and making a living doing it. We founded Constellation & Co. on the idea that community is important in life and in business, and that business and life should work well together. It starts with us - we're a married couple, and we collaborate closely on each client project, even if it's just talking out ideas over dinner. We also work closely with our clients, getting to know them beyond their preferences about paper and pantone colors, so we can offer them a design that feels authentic. Our clients bring us into their lives at important moments like planning a wedding or launching a business, and we take our involvement in those times seriously. We have two employees that are dear friends. And (this is my favorite story) we even had an intern that went on to become a wedding invitation client. She then launched her own business, we did her branding and business cards, and now we're her client - she does all of our studio and product photography. She's responsible for the pretty pictures you're looking at today. Outside of our company, we work with a large network of creative people and small businesses whose skills and products enable us to tackle bigger projects and offer more exciting work to our customers. The big picture for us is, we can't do this alone. Now that you know us a little better, I want to share with you how we got here. And I promise to be honest. I would really love for the design community to believe that i'm crazy rich and glamorous. But I believe that our genuine selves are a lot more interesting than the things we put on Pinterest. Although, I still love Pinterest. My career has been a series of reality checks, and this is an effort to present them honestly to you. And it might as well be a timeline, because, as you know, graphic designers love timelines. In 2008 Brad and I visited Seattle with friends on our winter break from school. We fell in love with the city and spent the next couple years daydreaming about moving here. I even had a poster of the skyline in my dorm room. While dating, Brad and I had a daydream about someday (after our crazy successful careers), starting a company together that focused on the handmade. We knew it was something we wanted to do… but in a really long time, after we'd filled a swimming pool with cash. Spring break of our senior year, we spent a week interviewing at several Seattle companies, including Hornall Anderson, Methodologie, etc. etc. In every interview, we heard about layoffs, closed intern programs, and the economy. Absolutely no one was hiring junior designers. As graduation approached, our professors made grim predictions, family friends suggested we start practicing "welcome to Walmart," and "can I take your order?" All in all, there was a lot of sad head shaking. We graduated, and although we didn't have jobs or a solid plan, Seattle was were we wanted to be. So we got in the car with our limited belongings and we drove here. And when we made it to Seattle, we took a lot of trips to IKEA. And then we started applying for jobs. And we got married! (Because there is no one in the world I would rather walk through this crazy life with.) And we applied for more jobs. And the abstract concept of debt became a concrete concept. And the recession we'd been ignoring became the recession that was defining our adult life. Along the way, we did a lot of jobs. We worked as much as we could, wherever we could. Some of the jobs were great - we both spent time working freelance for some fantastic people. But a lot of the jobs were terrible - I spent a week as a receptionist, I worked retail, and I spent several months with an ad agency, taking photoshop files the "ad guy" did and reproducing them in illustrator for print. And I did that 12-14 hours a day. Often with no food breaks. Right around this time, I had a realization. Hating my job isn't working for me. I was absolutely miserable. We paid way too much for school for me to already hate my career. Around this time, Brad started a contract at Microsoft, which was awesome, because my realization was great for my personal satisfaction, but terrible for paying the bills. But once I realized that I was okay being broke doing something I love, I knew that I had nothing to lose. I quit my terrible job, took an intro to letterpress class at the School of Visual Concepts, and sent a lot of "please let me work for you for free" e-mails to the letterpress community in Seattle. Thankfully, my e-mail bombs worked, and I spent a year apprenticing with Rebecca Mullins, the owner of Myrtle Alley Press in West Seattle. I got really hands on, spent a lot of time doing "pay your dues" type projects around the shop, and eventually got to learn the finer points of letterpress printing. And I absolutely loved it. Towards the end of my year apprenticeship, Brad and I started taking clients, producing products of our own, and launched our website. Around this time, I read a lot of articles on the appropriate way to start a business. I realized quickly that the articles were not written for me. I was 23, broke, and didn't know the first thing about starting a business. I was a very unlikely candidate for being an "entrepreneur." I sat at my computer for days trying to write a business plan. It was really daunting. Maybe you've been there and given up. (I really wanted to.) But here's the good news: at this phase, your business plan is more like writing on toilet paper than carving a stone tablet. You have to get started before you'll know what you want to do, what you're good at, and what you can get people to pay you to do. Our website launched with copy that said something like, "Dear client, if you give us money, we'll do whatever you ask." As we took on more client work and got to know our business better, it became clear what our specialties were, and which kinds of jobs we'd never take again. If you don't get started, you can't even learn from your mistakes. You have to get started. So we got started. We moved into a tiny corner of the 619 Western arts building, and bought our first full size press. Before I continue, let me show you a photo of our first printing press. It was a glorious mess. The press was in pieces, covered in rust, and had been dropped off a truck. But I took one look at this press, and I said: I'LL TAKE IT. I saw the potential in this press, and I wanted to be the one to save it. So we paid the lady, and put it on the truck. It took us well into the night to actually get it into the building. Moving a printing press is the most humbling thing i've ever done. And it's just as humbling every time I do it. I like to think of myself as an island. I want to do things by myself, take responsibility, and work as hard as I can to make them happen. Moving this press the first time forced me to ask others for help and depend on them to get it done. I was completely powerless to move this press on my own. It's something I fought tooth and nail. But that lesson has been more and more important as our business has grown. Let me take a moment and admit that this whole thing sounds crazy. We purchase, restore, name, and operate 100+ year old machinery that is incredibly heavy, a nightmare to move, and difficult to repair. If I didn’t passionately love this nonsense, I would be crazy to do it. Nothing about letterpress is glamourous. It's a greasy, inky, sweaty, exhausting business. And I love it.I've found, that in small business, love is mandatory. When we finally got the press into our studio, I spent upwards of 40 hours with WD40 and wire brushes, scouring untold years of rust, dirt, grime, and nonsense off of the press. But we put in the time and elbow grease, and were printing our first client job in the new space with our new press by the end of the month. It took us 30 days from decision to printing. That January was really stressful. We had overhead for the first time, and after moving the press, I felt the weight of our decision all too clearly. I had a lot of "WHAT HAVE I DONE" moments. Those first few days, I felt like I was swimming in the ocean with this printing press tied to my ankles. Getting into small business is difficult. I won't belittle that. The "just get started" enthusiasm is not enough on it's own to get you through the "we're going to go bankrupt" fears. You have to love what you're doing. Love is mandatory. We learned to start with what we could handle. We knew that at $325 per month, we could afford our overhead even if we never got a client job. That price meant we were at the top floor of a questionably safe building, in a space that had been previously occupied by an adult film studio, but we could afford it. We had to manage our expectations for that space - It wasn't perfect, but we were doing what we loved, and that had to be enough. We learned to make our space home. It was tiny and windowless, but we treated it with love. You have to want to be in the place where you work. You'll spend the majority of your life there. Make it a place you want to be, and your clients will want to be there too. We packed dozens of people into the space on art walk nights, and over the months, taught hundreds of people about the history of printing. It was amazing. We also learned that we have freedom to produce quickly and often. We designed and printed most of our products for the first time in this tiny space. We would get an idea, talk it out, sketch it out, and then produce it. We bought a printing press so that we could produce our ideas quickly and get them out into the world. We try to avoid putting our ideas into a folder on our desktop labeled "things i'll get around to." It's been my experience that those just don't get done. We have the technology to keep the time from idea to release short and sweet. It's been important for us to have the machinery, materials, and strategy in place to jump on good ideas. The things we make are ephemera. They're made to send, enjoy, and keep or recycle. They aren't forever. Nothing we create is forever. So why all the pressure? Create and release your ideas into the world. You won't know how they'll be received until you send them out. Some ideas will fail. Some will succeed. Some things will surprise you! And you'll have that information to revise the idea for the next iteration. And lastly, we learned to expect change, because it's always coming. After 8 months in the 619 building, we were notified it was unsafe, and given 2 months to find a new space. That was a rough day. There was a lot of yelling. But as we talked it through, we realized that this was great timing. We'd grown a ton in those 8 months. Our business had really taken hold. We'd had our first intern, and were taking on our second. We needed more room, and we knew a lot more about our business than when we'd started. Constellation had gone from a question mark to something we knew intimately. And this was a great opportunity to find a new space to fit our growing business. So, within a year of buying our press and moving into our first studio, we were doubling our square footage and moving into in a building with other artists and small business owners. We love our studio. It's been a joy to work in, and our clients have loved coming into it! We used to meet a lot of clients in coffee shops for their convenience, but now we only meet with folks in the studio - it does a better job at selling our work than we do! And in very tangible ways, it feels like home. We share events, meals, conversations, and collaborations in this space. And we work. A lot. In the Spring of this year, we brought on two part time employees. The work had gotten too heavy for me to tackle on my own. And the "weight" of the work is lighter when distributed. This thing is bigger than me. I've learned that not only do I need help, but I must accept help, and even more importantly - ask for help. For awhile, fear of failure kept me from bringing people on. It's scary being responsible for other people. But bringing in fresh eyes, time, and enthusiasm has allowed me to breathe, to invest my time in parts of the business that are otherwise neglected, and I get to share what i've learned with others. I'm so thankful for the ladies that support me on a daily basis. I sleep better at night when I know I have help, and my life is sweeter having more people to share what I love with. We are continuing to grow - we've taken on more space in the collective, and brought in a second press. There are a lot of growing pains, but we're learning a ton. I work a lot, and there are certainly days that I ask this question in frustration. But I always come back around to this: I love that my job is a way to build relationships. We work with creative people, clients, and other small businesses. I love getting to know these people. I love that I get to collaborate with my husband, and I love that someday, we'll have print shop kids. I continue to do this because I love to do it, and I love the people it's brought into my life. On the days when i'm overworked, underpaid, and exhausted, it's these people that keep me pressing on. Where am I? What is specifically needed and desired in my city? I love this city, and it's an honor to be a part of what's happening here. I have to continually remind myself to get out of the studio and be in the city. It's easy to isolate, but it's so important to be aware of what's happening around us. What do they value and what are they looking for? It has been so important to get to know my clients, not as a demographic, but as individuals. And working for clients has been a continually humbling experience. I'm constantly learning to put their joy above my pride. Their happiness is more important than my idea of good design. But that leads me to: How can I educate my clients? It's my responsibility to teach my clients what good design is, so that they know it when they see it! And in addition to my clients, how can I educate the public about the history of what we do? Education is a big part of preserving this historic craft, and we're glad to do it. We've done several tours with college classes and homeschool students, and bring people into the studio during open house nights to give them demonstrations of how printing works. And next month we'll be launching a monthly one day workshop for graphic designers on how to design and prepare files for letterpress printing. Who are my peers? How can I collaborate with them? We're in the process of launching a large scale collaborative project with 26 designers, who are each tackling a letter of the alphabet and producing an art piece with the concept of Cosmic Sans - a space and/or sci-fi related interpretation of comic sans. It's really nerdy. But how better to engage 26 of our peers and create something together? We're excited. So, back to the title of the talk. What does this have to do with the recession? What recession? My whole career has existed in the recession. I love what I do, and not getting a job forced me to pursue it. In many ways, this recession is the best thing that could have happened to me. These past three years, we've been hard at work, building something. I haven't taken away a large paycheck, (or often any paycheck) - but If I could go back and pick any of my "dream jobs" from college, I wouldn't. I LOVE my job, and I'm blessed to do it. We've built something that is growing, I can't wait to see what's in store for the several years. Recently I helped a friend send out wedding invitations for her sister. Her husband did the design as a gift, we did the printing, and my friend (as maid of honor) took on the task of addressing and sending out the invitations. We took a trip to the post office to pick up stamps, and found that the options were dismal. Stops at 3 post offices revealed that Evergreens are nearly the only thing kept in stock in the Pacific Northwest. This outing also brought back memories of our own wedding invite stamp dilemma - we sent postcards for save the dates and response cards, and the only postcard stamps we could find were polar bears. Polar bears just didn't match our theme. We carefully craft each element of the wedding invitations we design & print. Paper, envelopes, ink colors, string, etc., are all chosen with unity in mind. However, when we hand off the finished pieces (typically wrapped in brown paper and tied with coordinating ribbon or string), we're leaving stamp choice up to the couple. And until now, we hadn't really thought about it. If you've had the same stamp woes, don't be daunted by the depressing options at your local post office. If you're not interested in the traditional rings, roses, or cake, fear not! Here's the good stuff. Recently we discovered Champion Stamp, an online shop based in NYC that sells uncancelled vintage stamps. These stamps have never gone through the mail, so can still be used as valid US postage. If you can't find a modern stamp option to suit your correspondance, why not group several vintage stamps together? This is especially effective for postcards, since they require so much less postage. We placed a stamp order a few weeks ago (we've got exciting things planned for them), and photographed some of our favorite combinations & ideas. Somehow I missed finding out about Pinterest until recently. (I suppose I knew it existed, but was avoiding what could be a potential time bandit.) Since signing up, i've definitely lost hours to pinning and searching for things to pin - but they've been really enjoyable, inspirational hours. It's a great tool for aggregating the cream of the crop from my large list of online inspiration tools. (To name a few: Google Reader, Svpply, shared links on Twitter, etc.) And now that they've launched an iPhone app, (just in time, as I mentioned a desire for one just a few days prior to the announcement!) I can pin things that I see in the "real world" as well. (A few examples: products seen in stores, images/type from books, signage, etc.) Here's where you can find my pinboards - I hope you enjoy browsing them as much as i'm enjoying putting them together! Here are a few items from across my various pinboards, brought together by the color of sunshine (which has just started showing its face in Seattle).